25 X 20 White Steel Return Air Filter Grill Discounts Apply ! Purchase a return air grille for commercial or residential building projects in residential, commercial or retail spaces. To put the finishing touches on residential building and to cover up duct holes, purchase a return air grille with filter such as this one. This return air grille is an easy clean air solution for residential building, as it features a hinged faceplate, allowing for quick filter replacement and easy filter access. 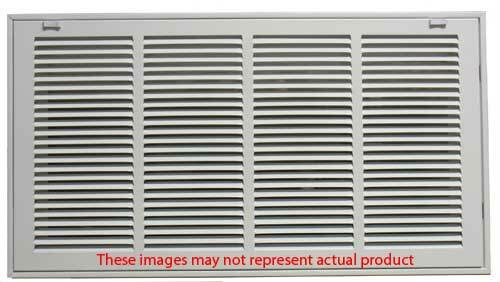 The large faceplate of this return air grille provides for efficient air flow from duct work in either the ceiling or wall. Perfect for your home, office or retail space during residential building, this return air grille features sturdy stamped steel construction and is sealed with a durable clear lacquer coating. Please note that this filter grille is only suitable for wall or ceiling installation and does not come with a filter, which must be purchased separately.